June 1, 2018 - New Yorker Electronics has announced it will be distributing MoxiE Inductor Corporation’s new MOX-HCPI-4233 Series of Flat-Wire Power Inductors. MoxiE, a manufacturer of inductors, chokes, coils, LAN magnetics and transformers, designed the series as a direct replacement for Coilcraft’s AGP4233 product line. Product dimensions for both devices are identical at 42mm x 35.8mm x 28mm. 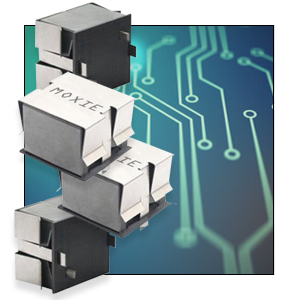 The new MoxiE series offers high inductance and a current rating to 97.90A. With Power Supply Designs, the series encompasses inductance values from 6.80 to 470uH (inductance measured condition: 100kHz, 0.1V). The flat-wire winding design provides low DC and AC resistance. The high-current power design makes it well suited for power supply applications and with the through-hole mounting for robust board placement it is also widely used in automotive and telecommunications applications. Like all MoxiE products, the MOX-HCPI-4233 Inductor Series is RoHS and REACH Compliant. This series delivers high inductance, high current, low magnetic loss, low ESR and low parasitic capacitance (with all MoxiE test data based on 25°C ambient temperature). Both the operating and storage temps are -40°C to +125°C. The zero defect assured products are packaged in plastic tray (12 pieces per tray) with 60 pieces per carton. New Yorker Electronics is a franchise distributor of MoxiE Inductor Corporation and supplies its full line of High Current, Shielded and Unshielded, Laser Cut Chip, Ceramic Chip, Ferrite Chip and Power Inductors; SMD and Through-Hole USB Connectors; RJ45 Connectors, Radial Leaded Toroids, Radial Power Line and Common Mode Chokes and more.